A JAPE tutorial. August 2009. Thakker, Osmin and Lakin have made this JAPE tutorial. The nightly snapshots from August 13th include LingPipe from Alias-I, a set of popular learning-based text analysis modules (see their site for licencing details (the version bundled with GATE is under their royalty-free licence). GATE Summer School. July 2009. Apologies to those who couldn't get in - we'll do it again in the winter! GATE 5.0 final release. June 2009. 5.0 is here... download GATE here. For the list of changes see the changelog chapter of the user guide. New publicity materials. May 2009. We've updated our 4-page GATE brochure and added a 2-pager. GATE Summer School. May 2009. The summer school is nearly full - book now if you want to come! GATE at Text Analytics 2009. March 17th 2009. Check out the programme at %image(images/text-an-09.gif). New architectures mailing list. Jan 13th 2009. René Witte has set up a new mailing list on software architecture for language engineering (see also René's lab's tools page which has several GATE plugins). Grimes on Spock on GATE. Dec 2008. Seth Grimes and Andrew Borthwick on interesting GATE-based stuff at Spock. Crime and punishment revealed. 11 November 2008. GATE 5.0 beta 1 released. 31st October 2008. The first beta of GATE 5.0 has been released. This release includes major additions to the JAPE language, support for resource configuration via Java annotations, and much more. You can download GATE from here. For the full list of changes see the changelog chapter of the user guide. A user writes... July 2008. Dean Williams says "I think, more than anything else, the thing that makes GATE stand out for me, pa rticularly amongst UK research software, is the attention to its engineering (an d just making sure the code actually works). I'm sure that is part of the reason for the widespread acceptance of GATE as the default platform for developing IE (and wider) apps." Cheers Dean (the cheque's in the post ;-) ). PERMIS security framework using CLOnE. April 2008. The PERMIS authorisation system from Kent Computer Science uses the GATE team's CLOnE ontology engineering language to help security policy authoring. A new ICON. 1st February 2008. Sheffield is now host to the Institute for Cognitive Informatics (ICON), a new inter-disciplinary initiative founded by Computer Science and Information Studies. LarKC project site. January 2008. The new LarKC project, starting in April 2008, is now on-line. New publicity materials. November 5th 2007. As part of our input to the IRFS symposium, Kalina and Valentin have produced a new GATE flier and GATE poster. New PERLS initiative. November 1st, 2007. One of the thing that GATE has contributed to the commnuity over the years is better experimental repeatability. Now that bandwidth and storage are so cheap, we can save the software and its runtime configuration as well as just the results. Our PERLS persistent experiment repository initiative seeks to exploit this to make our science better, cheaper, faster! Beam me up Scotty... October 2007. The people at Spock must be very tired of Star Trek jokes, but it's their own fault for choosing the name! Anyhow, they're using GATE for part of their names-based web browsing system; take a look at spock.com. New Wiki/CMS project. October 26th 2007. The GATE team have started a new open source Wiki/CMS project at sf.net/projects/gatewiki called CoW, for Controllable Wiki. CoW is (amongst other things) a vehicle for our experiments in controlled languages for information structuring. See gatewiki.sf.net for more details. Version 4 includes major new facilities for annotation indexing and search, machine learning, scaleable ontology support from OWLIM, ontology-based document annotation, and parallel corpus alignment. There is a raft of efficiency and infrastructure improvements including revamped HTML handling, Java 5 support and numerous optimisations and bug fixes. The set of plugins available has expanded to include around 150 components, which integrate with many high-quality language processing tools from the wider research community (plugin list). Version 4 change log. SAFE: Semantic Annotation Factory Environment. July 2007. Early versions of SAFE, a new approach to semi-automatic large-scale semantic annotation are now being trialled at a small number of sites including Harvard Medical School's Computational Biology Initiative. 10 years of Java library development. June 1st 2007. How was your bus ride? May 2007. Fizzback are using GATE-based information extraction to process customer feedback for clients like First, National Express, etc. Linked from our demos page there's now a demo of our work in the PrestoSpace audiovisual preservation project where we do semantic indexing of video streams using speech recognition for temporal specificity and text analysis for conceptual richness. GATE 4.0 beta 1 released. 24th April 2007. The first beta of GATE 4.0 has been released. Major additions include ANNIC - a tool to search a corpus for annotation patterns, OCAT - a tool for manual annotation of documents using ontologies, and completely rewritten ontology and machine learning APIs (using OWLIM. You can download GATE from here. For the full list of changes see the changelog chapter of the user guide. GATE tops patent classification competition. Jan 2007. The GATE team came top in 2 of three categories in the NTCIR patent classification competition. Six research groups submitted 44 runs for the task; one of our runs achieved the best results among the submitted runs according to two of the three measures used in the evaluation, namely Precision/Recall/F1 measure and R-Precision measure, and obtained the second best results according to another measure A-Precision. This work was based on Support Vector Machines with uneven margins, a technique being applied to diverse semantic annotation and classification tasks by Y. Li at Sheffield. New GATE on-line tutorials. Jan 2007. Check out our new on-line tutorials of common GATE tasks. MSc in HLT. December 2006. There are funded places available on Sheffield's MSc in Human Language Technology. This is an excellent course and a great way to start a research career in this field. Researcher updates new page shock! October 2006. 10,000 downloads in 6 months. July 2006. Since we moved GATE releases to Sourceforge late last year we've had more than 10,000 downloads. Innovative startup mines personal data with GATE. July 2006. A new company called garlik ("powerful stuff") from the founder and previous CIO of Egg PLC has been launched to give consumers better control over their personal data. The team are using GATE for Information Extraction from web pages. New research jobs. Spring/Summer 2006. The GATE team has vacancies for two more programmer and research associate jobs in Sheffield. GATE 3.1 released. 7th April 2006. GATE 3.1 has been released, with lots and lots of new stuff. This is the final release before version 4 which is scheduled for later in the year and will include signficant new functionality such as: a brand-new machine learning layer; enhanced web services support; the "annotations in context" concordancer and rule authoring component; improvements to the JAPE language (including a Java version of the innovations made in OntoText's JAPEC compiler). IBM's UIMA team go open source. 5th April 2006. UIMA has been open sourced by IBM, creating additional demand for GATE's open source text analytics components. GATE Training Course. April 2006. Ok, we give up! After many requests, we're starting a series of GATE training courses. The first one is April 27-28th 2006. Places are limited. GATE 3.1 beta 1 released. 19th December 2005. The new version includes a UIMA interoperability layer, a new Ontology API, and a much faster implementation of JAPE from OntoText. See the release notes; follow the download link. New plugins page. December 2005. There is now a list of plugins for GATE. Send us your links and we'll add yours! invited speaker Alfred Spector, Vice President of Strategy and Technology at IBM Software Group called it "great work"
Thanks to all contributors, and let's keep up the momentum! New project on Networked Ontologies (NeOn). September 2005. GATE will play a key role in the new European Integrated Project NeOn (Â12m over 4 years from 2006-2010). NeOn will develop support for the full lifecycle of networked ontologies and metadata, their collaborative and distributed development, and contextualised methods and tools. Just what you always wanted. September 2005. New research jobs. August 2005. With four new projects starting in 2006, the GATE team is now creating three new research jobs in Sheffield. CLOSING DATE 15th SEPTEMBER! GATE number 1 in Google. July 18th 2005. Out of around 30 million pages, gate.ac.uk is the number 1 hit for the word "GATE": http://www.google.com/search?q=gate. GATE and IBM's UIMA to interoperate. June 2005. IBM's Unstructured Information Management Architecture (UIMA) is to be integrated with GATE under an IBM faculty award. This will enable GATE users to profit from IBM's enterprise-level deployment options, and UIMA users to profit from the wide range of components and visual tools available in GATE. Advertise your project. April 2005. Are you working with GATE? Got a URL? Advertise it on our pages by filling in this form. Workshop on audiovisuals and semantics. Feb 2005. A workshop at ESWC 2005 will take a snapshot of the state-of-the-art in the applications of semantic technologies to multimedia data. Ontosearch Russian system uses GATE. Jan 2005. Ontosearch have developed a Russian language processing solution using GATE. Excellent result in Pascal challenge. Jan 2005. In the Pascal challenge on machine learning for Information Extraction, our GATE-based came second in most tasks (first place was a system from the organisers, which was also used in the data preparation). This system uses SVMs with uneven margins. New humanities computing project. Jan 2005. The NORA project, which will create analytical tools for large, full-text feed the D2K system for subsequent data mining and visualization archives, has chosen GATE as an extraction engine, feeding the D2K system for subsequent data mining and visualization. GATE version 3.0 released. Jan 14th 2005. Version 3.0 is now officially released. Thanks to all contributors. See the release notes for details, or download. We would like to point out that this release is ahead of schedule, and that several airborne porcine objects were recently sited in the skies about Sheffield. GATE number 2 in Google. December 1st 2004. "GATE" is a very common word, and relates to lots of well-known entities, but if you Google it (http://www.google.com/search?q=gate) gate.ac.uk is now number 2 hit. VIKEF Integrated Project using GATE. November 2004. VIKEF is an Integrated Project whose purpose is to provide an advanced software framework for enabling the integrated development of semantic-based Information, Content, and Knowledge (ICK) management systems. VIKEF will be using GATE for the development and testing of components that support basic semantic annotation of linguistic content including the design of the subframework of component integration, the creation of linguistic ontologies and the tuning of natural language processing tools for English and Italian. New ISO project starts 2005. October 2004. The GATE team will start a new project related to ISO TC37/SC4 early in 2005. The project will produce a reference platform for new standards in language technology. We're hiring: see our jobs page. New medical project. October 2004. Medwrite Inc. are using GATE in their advanced software for medical applications. Supercomputing for text processing. August 11th 2004. The National Center for Supercomputing Applications has released a parallelised data mining toolkit, Text 2 Knowledge, that is integrated with GATE. Distributed processing using GATE is increasingly common, including projects at NCSA, Merck KgAa, OntoText, SEKT, MyGrid, SWAN and CLEF. GATE 3 Beta 1 released. August 6th 2004. A beta release of version 3 of GATE is now available. Better MAC support in version 3. August 2004. The upcoming version 3 of GATE has better support for MAC / OSX, including toolbar and dock integration. Version 3 is now in beta release. GATE in .NET at BT. July 2004. British Telecom Exact Technologies has integrated GATE with .NET to provide Microsoft-compatible web services for deep structure analysis. This is part of the SEKT project. 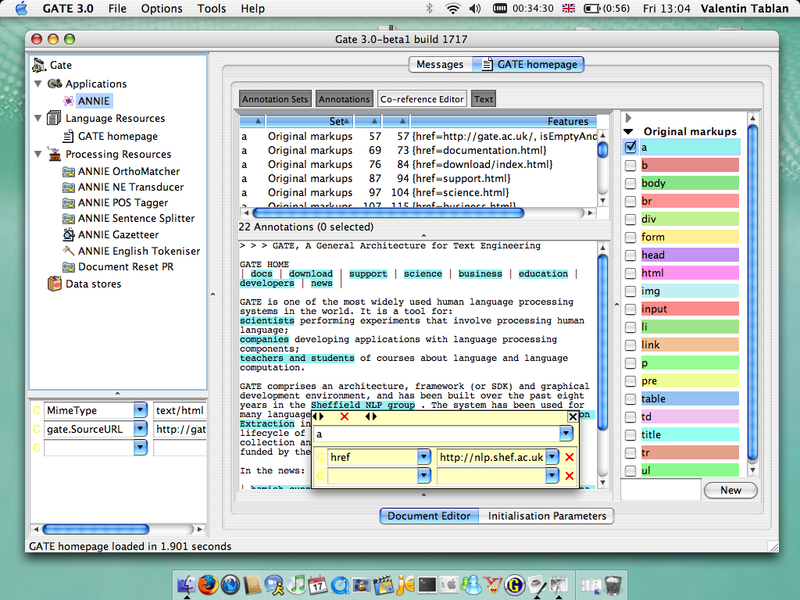 The system has also been integrated with the TextToOnto tool for creation of ontologies using text mining algorithms. GATE in Pascal challenge. July 2004. The Pascal network is using GATE for corpus annotation for the Extract Implicit relations from documents Challenge. New document interface. June 2004. 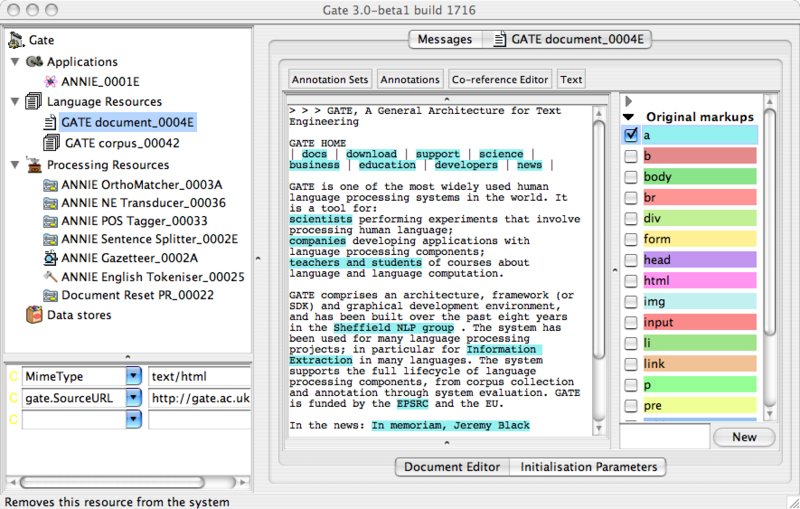 GATE's document viewing and editing components have been comprehensively revised in order to provide better support for semantic annotation of text relative to ontologies, in work partly supported by the AKT project. Dr Jeremy Black, one of the world's foremost scholars of Sumerian, has died. This is a source of great sadness to all who have worked with him. We hope that our future effort in this area will serve as a small (though inadequate) memorial to his excellent work. BBC reports GATE-related project. March 2004. The BBC's technology news site reports the SEKT project. GATE plays a key role as a language technology development and deployment vehicle in SEKT's work on next generation Knowledge Management. See also Net Imperative's coverage. New type of transduction mechanism. February 2004. New projects start. Jan 2004. These EC 6th Framework projects will deploy GATE-based language processing in a wide range of new areas, from multimedia indexing to structured information spaces and the Semantic Web. GATE user survey results. December 2003. In a recent user survey (of 4,637 people who have downloaded the current version of the system, response rate 9%, conducted in Autumn 2003) around half of those who replied were using the system actively in research, applications development or teaching. Allowing for the self-selecting nature of the sample (those who replied to the email) we can conservatively extrapolate that the system has thousands of users at hundreds of sites, making GATE one of the most widely used pieces of language processing software in existence. The results of the survey are feeding the current version 3 release cycle, due to complete spring 2004. EMILLE project completes. December 2003. The EMILLE project has finished its work on a 63 million word electronic corpus of South Asian languages (especially those spoken in the UK). GATE has been extended during EMILLE and now has some of the best multilingual language processing support tools available. Workshop on HLT for the SW. October 2003. At this year's International Semantic Web Conference we ran a successful workshop on Human Language Technology for the Semantic Web and Web Services. New AHRB project starts. October 2003. A new GATE-based resource enhancement project from AHRB has started. GATE 3 planned. October 2003. Work on the GATE 3 version will proceed for the rest of the year with a release early next year. Want to see a feature? Fill in our survey! Jobs available in the GATE team. October 2003 - March 2004. We will soon create a number of new research positions to continue to work on GATE and related projects over the next 3 years or so. "World class work" - Jim Hendler. 18th September 2003. At the AKT project mid-term review, Jim Hendler stated that the "NLP work is clearly world class". GATE plays a strong role in that work, undlerlying a number of systems including the ArtEquAkt 3-IRC collaboration and the MiAKT e-science project. Up. GATE for Slavonic languages. September 2003. The workshop on Information Extraction for Slavonic and other Central and Eastern European Languages at RANLP 2003 in Borovetz, Bulgaria, included a large number of papers describing work using GATE. Languages now being processed with GATE: Bulgarian, Russian, Romanian, Hindi, Urdu, Arabic, Chinese, Japanese, Cebuano, and many others. GATE version 2.2 released. August 2003. Version 2.2, a bug fix release with support for the latest JDK, was released in August. For details of what it contains, see the user guide. The HLT/NAACL workshop on Software Engineering and Architecture of Language Technology Systems (SEALTS) attracted a very strong set of papers and participants. MUMIS Digital Library project reviewed. April 2003. The MUMIS project on automating the production of metadata for Digital Library collections of sports has had a positive final peer review from the EC, who comment that "MUMIS is a project with very high exploitation potential... in both planned future R&D activities and commercialisation via products or services". The project scored 5 ("excellent") for Contribution to Programme and Sector Objectives. GATE contributed important elements of the MUMIS system. GATE used for TIDES "Surprise Language" Exercise. March 2003. As part of this program, GATE has been used for language processing in Cebuano. Within 3 days of the language being announced, we have adapted ANNIE to perform NE recognition in Cebuano. Preliminary experiments show a Precision of 85.1%, Recall of 58.2%, and an F measure of 71.65%. More information. GATE given "outstanding" review from EPSRC. 28th February 2003. A formal review of progress under the latest round of funding for GATE by the EPSRC has found the work to be "outstanding", the highest possible category. Research planning, practice and potential scientific impact were all found to be internationally leading, and the output of research staff, disemination of results, potential societal benefits and costeffectiveness all outstanding. Congratulations to the GATE team! Version 2.1 released. February 2003. GATE version 2.1 is now released with a number of new features and a lot of bug fixes. Download. Note that GATE now requires JDK 1.4 or higher. OntoText announce new GATE-based Semantic Web product. January 2003. Ontotext are using ANNIE-powered Semantic Web annotation as part of their Knowledge and Information Management (KIM) platform. Up. Machine Learning with WEKA. November 2002. With the integration of the WEKA machine learning toolkit GATE now has world-class facilities for adaptive language processing. Valentin Tablan of the GATE team will visit Waikato in March as part of a new development of User-driven Information Extraction in GATE. Up. Perseus project to use GATE. November 2002. The Perseus digital library, one of the largest and most advanced such projects in the world, will use GATE for corpus annotation and language processing. Up. Wordnet support and visualisation added. October 2002. GATE now supports WordNet as a Language Resource with associated visualisation component. Up. Semantic Web output. October 2002. A DAML+OIL exporter component now allows e.g. IE results to be exported directly into a Semantic Web format. Up. GATE discussion group archive on line. 15th October 2002. The gate-discuss mailing list is now on-line. GATE, the Grid and e-science. September 2002. Two new projects, MyGrid and CLEF, now starting will use GATE to deliver advanced language processing techniques in e-science Grid platforms. GATE will gain distributed deployment facilities, and, in related work, Web Services facilities. Up. GATE scores well in ACE competition. September 18th, 2002. GATE's entry in the ACE (Automated Content Extraction) competition scored well, improving over the last evaluation in each category. (ACE regulations prohibit publication of relative placements.) Up. GATE 2.1 Beta 1 released. August 2002. A beta of 2.1 is now available on the website, incorporating new ontologies, information retrieval and other new features. (Note: some components are not bundled with the main system mail us for details.) Up. ANC to use GATE. July 2002. The American National Corpus will use GATE. Up. Information Retrieval integrated. May 2002. Using the Lucene system GATE now has a full text retrieval system, which can also be used as a query engine over document annotations. Up. Reuters and Knight Ridder. May 2002. Reuters have started a project doing IE with GATE, and Knight Ridder have positively evaluated the system. Up. New ontology resources. May 2002. GATE now has an Ontology resource model, which may be populated via fast finite-state gazetteer lookup from texts. DAML+OIL output of ontologies is supported. For ontology editing see next item: Up. The popular Protégé knowledge base and ontology editor has been integrated as a visual resource in GATE. Up. GATE and Galaxy Communicator. 25th April 2002. GATE has been used in the Amities project to produce dialogue processing server components to run in the Galaxy Communicator architecture. Up. Entity recognition web service. April 22nd 2002. GATE's ANNIE advanced extraction system is now running in our web server as a service for entity recogntion - see the new web service demo. Up. PostgreSQL now supported. April 22nd 2002. GATE now supports language resource persistence via PostgresQL, bringing the benefits of an open source DataBase to compliment our existing Oracle and Java serialisation facilities. Up. Merck investigates GATE-based parallel IE. April 2002. Luca Toldo, research scientist for Merck KGaA in Darmstadt, will run GATE-based Information Extraction on a Linux cluster for bio-medical text mining and indexing. Up. A positive evaluation from Field Methods. March 2002. The Field Methods Human Language Technology portal has gives the new GATE release a very positive evaluation. Up. GATE Version 2.0 released. March 14th, 2002. Version 2.0 of GATE is officially released. The new version is a stable, robust, and scalable infrastructure for language processing R&D. Download. Up. Anaphora resolution components available. March 2002. Marin Dimitrov of the University of Sofia has produced an anaphora resolution system for GATE. Up. e-science uses GATE-based NLG. February 2002. The ArtEquAkt e-science project, producing composite descriptions of cultural artefacts and figures (e.g. Rembrandt) from diverse web pages, will use a GATE-based Natural Language Generation system. ArtEquAkt is a collaboration between the Equator wearable computing project and the AKT Knowledge Technologies project. Up. GATE at DUC. February 2002. Partha Lal at Imperial College is developing a summarisation system based on GATE and ANNIE. The system will be entered in the DUC, Document Understanding Conference evaluation. Up. Old Bailey project chooses GATE to catch thieves. Dec 2001. Sheffield University's History Department and the Humanities Research Institute are collaborating to produce a large collection of 18th century court reports from the Old Bailey in London. GATE's ANNIE system is being used to mark up the defendants and other trial participants. When complete, the system will allow researchers to access an unparalleled data source for the period via XML over the Web. Up. International review of UK computing cites GATE. July 2001. GATE is cited for its wide usage by a team of international reviewers (mainly from the US) that produced a document for the EPSRC, IEE and BCS (International Review of UK research in Computer Science, ed. F.B. Schneider and M. Rodd, June 2001.) The review states that the "UK is a world leader in speech engineering and computational linguistics" (page 22). Up. Natural Language Generation in GATE. Jan 2002. We now have our first demo of NLG tools running in GATE. The module produces a GATE document, which can be viewed in the graphical development environment. The current module uses the Exemplars framework from CoGenTex. In future we intend to experiment with their RealPro surface realisation component. (The NLG modules are not publicly available in the GATE distribution yet: to obtain the frameworks, please contact CoGenTex directly.) Up. GATE 2.0 Beta 1 released. Dec 2001. Version 2.0 of GATE, in development since 1998, is nearing completion, and this Beta release is a feature-complete version of the system. The final release is due early in 2002. Download. Up. e-Science Multiflora project funded by BBSRC. Dec 2001. Multiflora is using Information Extraction to create data in multiple plant taxonomies, producing a composite database of rich information in machine-processable form. The project has now been funded for an additional round by the BBSRC research council. Up. The Health and Safety Laboratory buys GATE-based system. Nov 2001. The UK Health and Safety Laboratory are using GATE to quantify the level of reporting of H&S data in company end-of-year reports, as the basis for developing guidelines for companies and possibly proposals for legislation. Up. AMILCARE embeds GATE-based language analysis. Nov 2001. AMILCARE, an adaptive Information Extraction system, uses GATE's upstream shallow analysis tools to bootstrap the extraction process. Up. GATE plugged in to Protégé. Oct 2001. The University of Southampton have integrated GATE as a plugin to the Protégé ontology visualisation and editing system. OntoText are working on integrating the system with GATE, to provide round-trip ontological engineering with language technology for the Semantic Web. Up. GATE-based IE indexes the Euro 2000 football tournament. Oct 2001. MUMIS, an EU-funded research project into MUlti-media Indexing and Search, has produced a conceptual index of the matches, so now you can go straight to all the video sequences where England conceded goals, for example, instead of having to suffer the whole game. Up. MUSE project deploys embedded GATE system. March 2001. The MUlti-Source Entity finder project has robust NLP at its heart, using multiple genre-specific ANNIE configurations to recognise names of people, places, IDs and other entities in a very wide range of documents. Up. Dimitris Kokkinakis of the University of Gothenburg has made a demo of Swedish NE available. The demo uses GATE version 1 and an adapted VIE extraction system.